Sold by Marcia Attamilgad for 40 Nobles. I would say any but "most" good warriors will keep all their melee skills up. After level 40 most all our skills are capped at 200 untill you reach level 50. It just makes sense to use these levels to work up the other skills, you never know when an item such as this will drop for you. Personally I started working 2hb with a sarnak battlehammer at level 42 mainly because I have heard so much about the ToD (Truncheon of Doom) but with the aggro proc on this wep it will go on my wish list also. MY SK has all the weapon skills maxxed, 1hs, 2hs, 1hb, 2hb, and piercing. #Jaguara, Posted: Sep 04 2002 at 8:59 PM, Rating: Sub-Default, (Expand Post) Too bad this isn't a monk item. Verant should focus on making a better game not better items. #SarithSilverwolf, Posted: Sep 04 2002 at 6:51 PM, Rating: Sub-Default, (Expand Post) If only I could use this...I'm one of the few Rangers who has got all weapon skills above 200(Except throwing, its like 130) and it would be a welcome upgrade to my Woodsmans Staff, and VI should reward people who keep their skills up with weapons of this caliber or greater, and put them in slightly lower encounters than equivalent 1 handers would be in. Why would a ranger want an item with a agro increasing proc... Wouldn't you rather the warrior get taunt than you? That makes absolutely no sense at all. Just because you choose to use 2hb you should get better items in an easier encounter? Why does that not make sense? Why shouldn't they reward those of us who have actually taken the time and trouble to keep ALL our melee skills maxed out? I can see, maybe, a better weapon that was easier to get, that required ALL of your melee skills to be maxed somehow...but Everquest isn't set up that way. I agree it doesn't make sense to "reward" people with 2HB skill. Just a thought from a cross-dresser who also plays AO :), in which weapons can require multiple skills, and most do. It may sound harsh at first but I'd like to see a game with a combination of EQ's and AO's skill advancement system. In EQ, you practice: everybody has all their skills maxed eventually so they're all pretty much alike. Maybe a good way is to combine the two systems: you spend points to raise your maximum in a given skill, then you have to practice to actually raise the skill to that limit. Most people do get their skills up in battle as oposed to paying for training, which gets pricey at the higher skill lvls. "That makes absolutely no sense at all. Just because you choose to use 2hb you should get better items in an easier encounter?" And yeah...this is pretty much a warrior item, only in soloing and easy camps would this be useful to other classes. I suspect Warriors with this will have little trouble staying on the top of the Aggro list ahead of Rogues, Rangers, and Monks. But I wonder, how many Warriors have kept up their two hand blunt skills enough so they would use this? As a Ranger, I tried to keep up all my weapons skills, but in the end only 1H slash and piercing are maxed out. The others, especially two hand blunt, languished. If you are a Warlord (lvl 60), you will have all your skills maxed out. Why? First, because you get bored just xping and you want to see some progress on something. Getting the skill bumps makes it worthwhile. Plus, you never know when you will get a great weapon with some particular skill (like 2hb, 2hs). Be sure to keep all your skills maxed. The only skill I don't have maxed is Hand2Hand. Why? Cause Warriors do very crappy damage with it -- and there are no good weapons that use that skill. 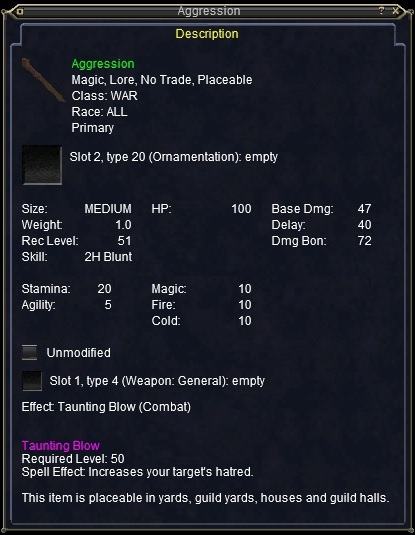 The majority of warriors who have good enough gear to solo use a weapon called Truncheon of Doom that is 33/44 and procs a 50% slow: its basically a necessity for warriors to solo, assuming they dont have a willsapper or something; I have one, and it definately keeps my 2hb maxed. I made a point to max my 2HB skill after level 40 and it has yet to pay off for me. Hopefully one day I will acquire a nice weapon like this to make it all worthwhile.